In the choice of cross vs crucifix, the Reformed Churches favour the use of the cross. These churches include amongst others the Methodist, Presbyterian, Apostolic, Protestant, Evangelical and Charismatic Churches. They came into existence after the Reformation started by Martin Luther, Johannes Calvin and Huldrych Zwingli. These divisions resulted in a series of religious wars fought between 1517 and 1648 in Europe. The dogmatic views on which 'reformed' churches differ from the Roman Catholic Church are many. These differences include the belief that the bread and wine consumed during Holy Communion are merely symbolic of the blood and body of Christ. i.e.they believe that the substances do not transmute (change into the body and blood of Christ). Reformers do not worship Mary, because they believe in the Trinity, namely the Father, the Son and the Holy Spirit. They also do not agree that the priests can forgive sins, because only God can forgive sins. We can see here that the reformists would lean towards the simpler symbol in the cross vs crucifix choice. The Reformed churches display simple crosses outside churches. They might also have a cross against a wall inside, mostly behind or attached to the pulpit. Sometimes they exchange the cross for the Chi Rho. The Chi Rho sign is a P with an X crossing the down-line of the P. This is still a very simple symbol compared to the elaborate crucifix. The X (xhi) and the P (Rho) are the first two letters of the Greek word Kristos. In some churches you might find a cross and a candle on a table next to the pulpit. The churches are mostly without decoration and the symbols on display will have a definite meaning. Each of these symbols and meanings are created for a certain time of year such as Easter. At Christmas you might even find a Christmas tree in the church. Lately it is in fashion for the ladies of the church to make a patchwork rendering of the crucifixion. In some ways this may be considered as an ongoing need to elaborate that resulted in the original contention of cross vs crucifix. This will be hung near the pulpit. There is some inbuilt irony in the cross vs crucifix contention, because even the cross in its simplest form is not originally a Christian symbol. Although it seems obvious that the Cross as a symbol for Christianity arises from the fact that it is the structure on which Christ was crucified, unfortunately, the reality is not that simple. Historians argue that Christ was not crucified on a cross. This is because in the original Greek texts of the Bible, the word used to describe the instrument of execution on which Christ died was called a stake (see image). The early Christians also did not use the cross or crucifix to mark graves in the catacombs in Rome. Although one could argue that it is because they were themselves executed in the same way. The cross was used as a religious symbol before the birth of the Christian faith as a “Symbol of Life”. The Egyptian Ankh for instance, looks similar to a Christian cross (see image). Constantine the Great who made Christianity the state religion had a vexillum as his standard. 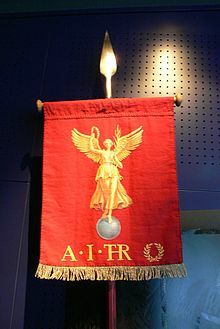 A vexillum consisted of a flag hanging from the crossbar of a cross, similar to the Processional Cross used in processions by the Roman Catholic Church. The design on his standard was the Chi Rho. What we have shown here for illustrative purposes is a reconstructed Roman military vexillum. In the choice of Crucifix vs Cross, Roman Catholics and the Orthodox Churches prefer the crucifix, in other words a statue or statuette attached to a cross. The crucifix can be small enough to wear around the neck or life size and hanging from the roof. It is also often rendered in paintings or manuscripts as part of the passion of Christ, i.e. depiction of his death by execution. The Orthodox Church split from the Roman Catholic Church in the 11th century. The split or “Schism” was caused because of theological and political differences between the Christian East and West. This infighting had been going on for centuries, which of course reflects strongly in the choice of cross vs crucifix. 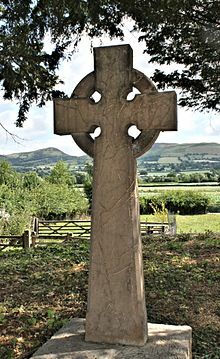 Celtic Christianity originated in Egypt, Syria and the British Isles and was eventually forced into non-existence by the Roman Catholic Church in about the 7th century after Christ. This branch of Christianity used both cross and crucifix in its highly stylized Celtic designs. although the stylized cross was the more common by far. It was in the Orthodox churches of the East where the crucifixion of Christ was first portrayed. The Monothelite and Monophysite heresies were causing problems for the Church. The proponents of the Monothelite heresy believed that Christ was only divine and not human and the Monophysite heretics believed that Christ was half God and half man. In order to deeply entrench the dogma that Christ was both completely human and completely God, Christ was depicted as hanging from the cross. ​ Here we see the first root of the debate for crucifix vs cross. This was continued in the Rabbula gospels. The Rabbula Gospels, written in 586CE carried the first depiction of Christ on the cross and although it was not completely realistic, it would be the inspiration for many to come. Remember also that by this time the cross would have been used widely in the church, therefore it would naturally be rendered as a stake with a cross bar. The heresies unsettled some of the monks in the east and they migrated to Italy. From there the style of the Rabbula Gospels spread all over the Christian world. 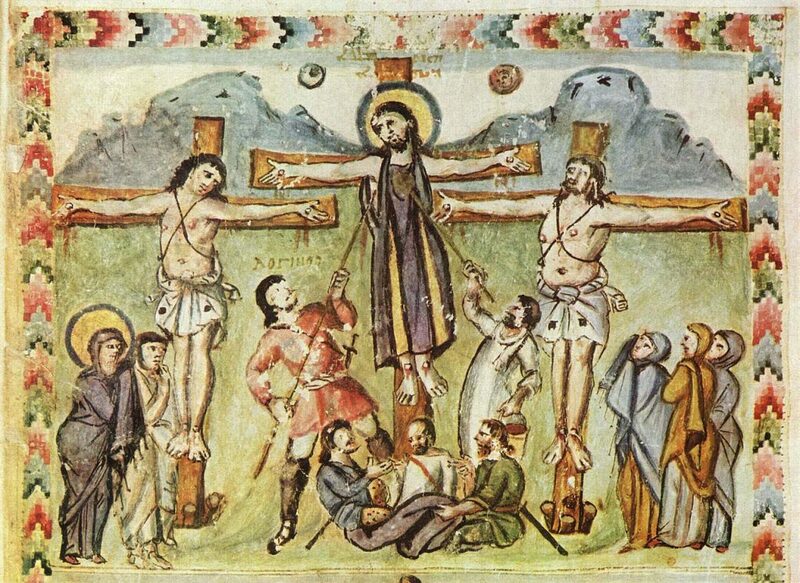 The Crucifixion was, for instance depicted by Celtic artists in illuminated manuscripts from about 670 CE. As from the late eleventh century the depiction of the crucifixion took on life size proportions. Sculptures in wood of the crucified Christ were attached to beams or screens at the entrances to chancel of churches. This type of crucifix is known as a rood. An example of these crucifixes is the Lucca Rood and copies from it are to be seen across Europe. The King of the Franks, who lived between 742 and 814, converted the Franco-German people to Christianity. It seems as if the inclination of these people to be more morbid than the people from Italy brought about a change in rendering the crucifixion. They portrayed their crucifixes with blood gushing from the wound in Christ side. The emphasis on blood eventually led to the Feast of the Sacred Heart, during which Christ’s love for humanity is emphasized. Another change came after the wounds of the crucifixion mysteriously appeared on the hands of St. Francis of Assisi in September 1224. From that time Christians became interested in depicting the five wounds of Christ. The body of Christ on the crucifixes were crowned with a crown of thorns after 1239. This happened because the church in Constantinople sent King Louis IX, what they believed to be the Crown of Thorns from Constantinople. Gradually and after many centuries artists, commissioned by the Church, rendered the Crucifixion of Christ in a realistic manner. At the end of the Middle Ages this realism became almost excessive. The custom of wearing a cross hanging from a cord or chain round the neck appears to have been known since the fourth century. Not only priests and monks wore these crosses; but lay people too. The crosses were sometimes made of metal or with a cavity for relics. In the West people associated with the church would wear crosses around their necks as a sign of rank. This habit started after the Reformation as a symbol for the Counter-Reformation. 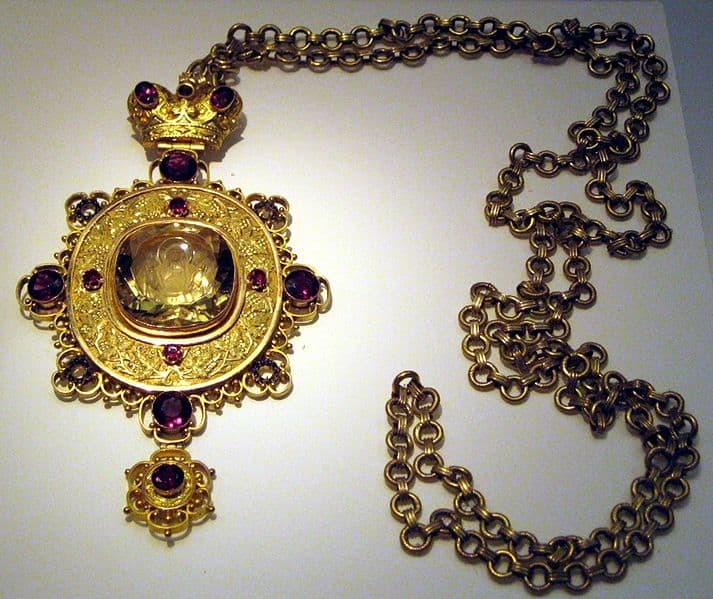 This pectoral cross or encolpion as it is known when worn by bishops of the Orthodox Church, suggests that the original cross on a chain was a portable reliquary, in other words a cross that holds a relic. After about 2000 years of religious wars, dogmatic differences and general unpleasantness about religious symbols, to many, the cross might have lost a little of its prominence as a Holy Christian symbol. It frequently appears in design and art and it is worn as jewelry by Christians and atheists, by gospel singers and Hip Hop artists, often with no understanding of its deeper meaning. But Christians know that true conversion happens in the heart, therefore it makes no difference which design you display. Cross or crucifix? Which one would you choose? We'll be adding more and more! Are you interested in the tale of the three kings at Christ's birth? That's also a fascinating story - click here to see why!